For children to reach their full learning potential, they have to come to school. 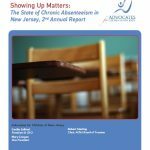 Yet tens of thousands of NJ students are “chronically absent,” or missing 10 percent or more of school days. When young children miss too much school, it is often linked with long-term reading problems, lower test scores and weaker social-emotional skills. As students get older missing school increases the chances of class failure, higher suspension rates, dropping out of school altogether. Addressing chronic absenteeism can improve academic achievement for all students and is especially important for young students to ensure they are on the path to school success. requiring schools with greater than 10 percent of their students chronically absent to develop plans to combat absenteeism with input from families and parents. View the report and school district chronic absenteeism data by county. 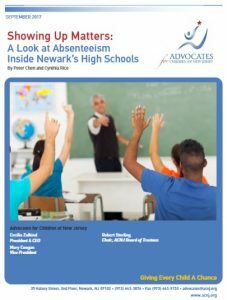 This report explores the complexity of chronic absenteeism in Newark Public High Schools and possible solutions. View the report and interactive charts. Newark absenteeism in the early grades. 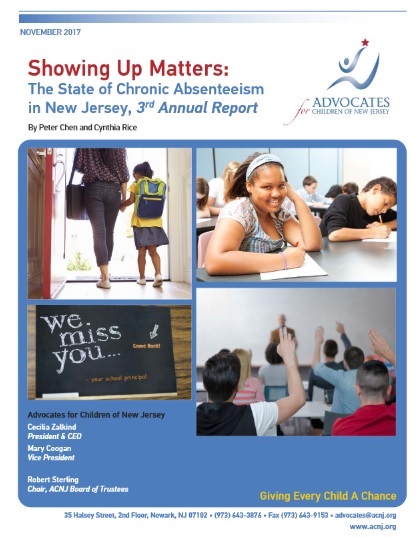 View report on chronic absenteeism in Newark. Watch speakers at Newark chronic absenteeism forum. Watch Cynthia Rice’s interview on chronic absenteeism in Newark.